China Mobile is one the largest carrier with more than 60 million subscribers got the next gen iPhone which is said to be iPhone 5 leaked. If we recall past, so in past we came across a news that Apples C.O.O Tim Cook was spotted at China Mobile H.Q in China. His presence their was a mystery for the time being and later on we cam to know that Apple is planing to work with China Mobile to get the next iPhone unveiled. China Mobile also claimed that they will get their hands on to the next gen iPhone in September without the support of 4G LTE. Well today a Chinese blog republished a picture which is said to be of iPhone 5. 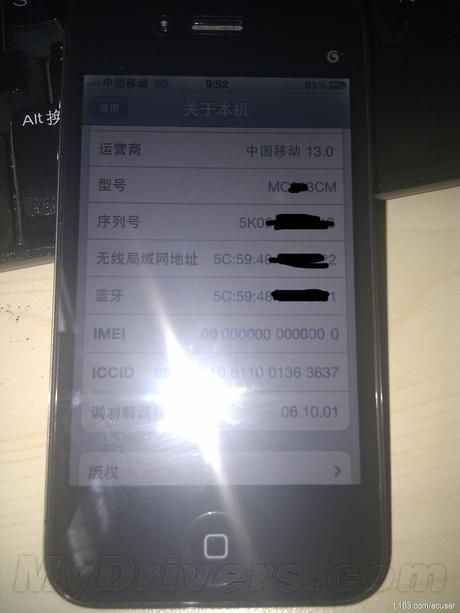 The above is an unconfirmed picture of iPhone 5 which shows that it is running 3G on it and if we see more clearly we can see the new baseband which is 6.10.01, though the new upcoming baseband in iOS 5 will be 4.11.01. It is said to be the prototype of next iPhone which is iPhone 5. It seems that it is in testing phases because the IMEI number is 0000.. If this is really an iPhone 5 so nothing much has changed. We hope that this is not the upcoming iPhone 5. What you people think about this ? Do let us know.